We offer quality repair and competitive prices for all of your exhaust system and muffler repair needs. Make sure to stop by our 227 Daniel Webster Highway location for an inspection, as a damaged exhaust can hurt both your car and the environment. 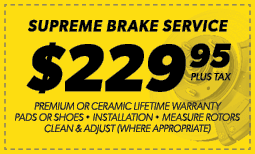 When you need brake repair, brake pad replacement, or even a total brake job, our local Merrimack, NH Meineke is there to help you with everything you need to drive (and stop) safely. Scott and his team go the extra mile to make sure my service stops are stress free. Work is done in a timely manner, my questions are addressed promptly and he explains everything up front. Both surprises. My air conditioner wasn't working well and I thought it needed a charge but Scott at Meineke found that it needed a part and fixed it quickly. Brought my car there for repairs prior to my oil changes I received Sean McCabe took very good car of me and the owner Scott was very reasonable with the price and was able to work with me .